What do a tiki bar, Pinup Girl Clothing, a ’51 Chevy and tattoos all have in common? To anyone who knows Mike and L.A., the answer is pretty obvious… it’s them! 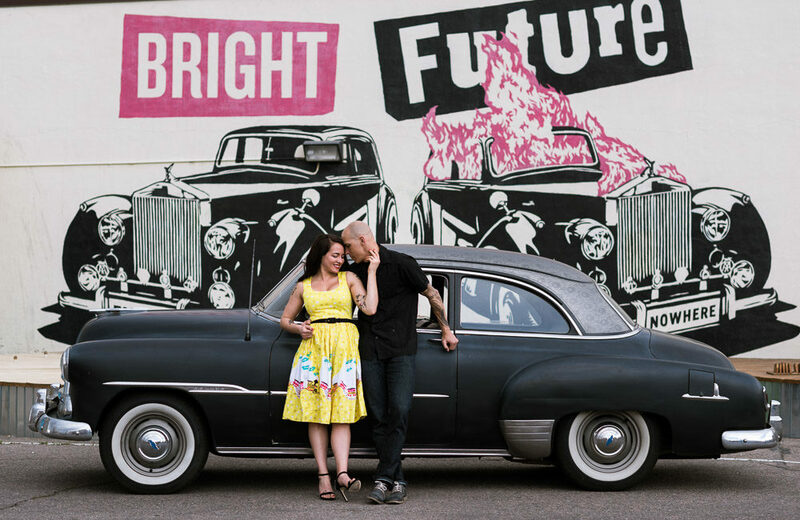 This amazing couple wanted some photos simply to celebrate who and where they are right now. We started with drinks at Adrift, their favorite tiki bar, followed by a cruise in Lola, the newest addition to their family. The thing that I think is the most powerful about photographs is that they truly capture a specific moment in time. By now, the tattoo on Mike’s left arm should be colored and shaded and will never look the way it did in these photos again. If L.A. and Mike move to a different city, now they’ll always be able to remember what Adrift looked like. As they age, they’ll be able to look back and say “even though we’re still looking pretty good… damn, we were HOT!” These images don’t just capture their love for each other, but how everything looked at a specific point in their relationship. Thank you L.A. and Mike for letting me be a fly on the wall of Adrift and cruise around in Lola’s back seat. I had a blast!